On Minamidaito Island there isn't a high school, consequently teenagers who turn 15-years-old leave the island to attend high schools. 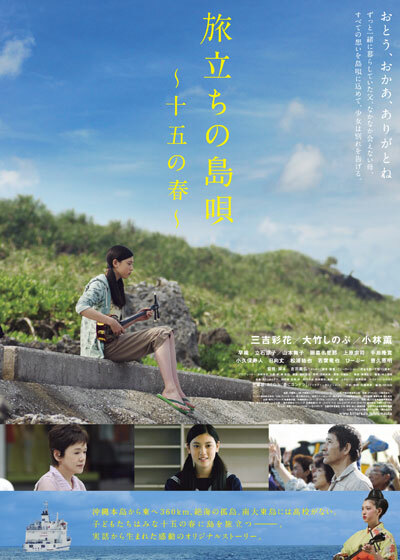 Yuna Nakazato (Ayaka Miyoshi) lives on Minamidaito Island with her father Toshiharu Nakazato (Kaoru Kobayashi). Yuna is the youngest child and she has two older siblings. She has one year left before she must leave the island to attend high school. Her father grows sugar cane on the island. Yuna's mother Akemi Nakazato (Shinobu Otake) lives in Naha, Japan, originally to watch over her older sister Mina (Saori Koide) while she attended high school there. Yuna Nakazato's older brother also works in Naha. Mina comes back to the island with a child. Every family on Minamidaito Island has a similar situation where the family lives separately. Yuna misses her mom, but she worries about her father, who will be left alone next year. Yuna is curious about the world and also feels unease over her future. Filming began March, 2012 in Naha, Japan. Filming also takes place on Minamidaito Island. StephM Mar 25 2015 9:47 am Very beautiful and touching movie. Do know who sings Juuku no haru at minute 58:42 in the movie? Thank you very much.